Manufactured by Comark, this versatile thermometer allows you to quickly and accurately determine the temperature of your fridge and freezer in order to ensure the safe storage of food or perishables. 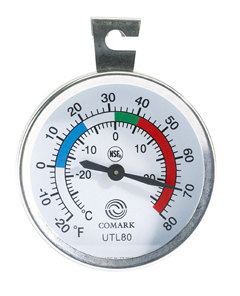 Featuring coloured temperature zones for quick reading and double stick tape for securing inside a refrigerated drawer or alternatively a built in hook to suspend it from a shelf, the Comark UTL80 is a simple thermometer to fit and use. Ordered at14.02 despatched at14.14 arrived in the Scottish Highlands at 10.30 the following day.Remarkable! The instrument has enabled me to set the correct temperatures for my 3 fridges and 2 freezers.All in all a 1st class service and a very useful piece of equipment. It does not work, the needle is stuck on 50 degrees. Sorry to hear that, Things do break and bi-metal units do get shaken up in the post. BUT why have you not contacted us about the matter ? we would of sent a replacement. We can only help if we know there is a problem. We have no way of knowing there is a problem usless we are told about it.